Ok, I said we wouldn’t suggest the Urban Decay Naked palettes. However, Urban Decay’s Electric Press Pigment Palette is so far from the Naked palette series it’s in another galaxy. No neutral colors here. The Electric palette is NOT for the faint-hearted. We are talking Rainbow Brite baby! With colors like Jilted, Freak and Thrash, it looks like they have taken a cue from Sugarpill Cosmetics, going nuclear with the color selection. Definitely targeting a younger crowd. However, even though I am close to birthday # 41, I still love bright colors. Am I too old for this palette? Who cares! On the Urban Decay website it’s touted as “Chaos-inducing Color” and they mean it. If you love color, this is the palette for you. Not sure how to use these high voltage colors? UD suggest even using your fingers to apply the colors. 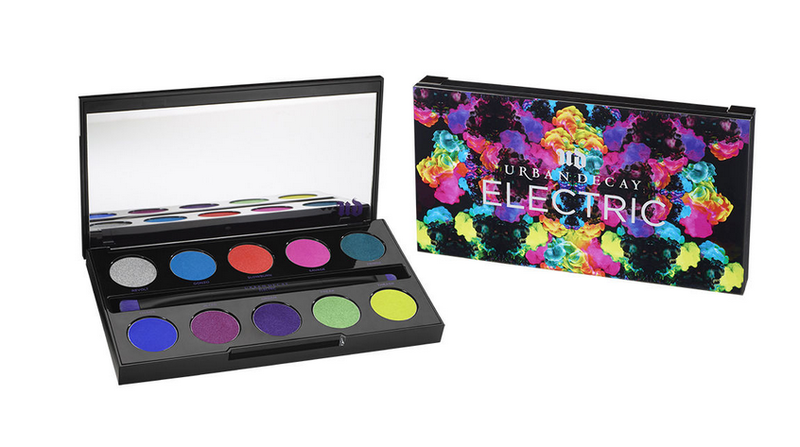 Check out UD’s website that shows top blogger looks with the Electric palette. AmyZ, Sr VP of Product Development at UD wearing the shade “Freak” from the Electric palette. Gorgeous! Giant mirror so you can make sure each shade is just right. I also wrote an article for Examiner. com (my paying gig) listing The Top 3 Palettes at Ulta. Check it out and let me know what you think. Seriously… I need the clicks…. click on it!!!! Thank you! What do you think of the outrageous colors in the Electric palette? Holla at ya girl in the comments below.